WAKEFIELD, Mass. – Vermont defenseman Taylor Willard (Naperville, Ill.) has been named the winner of the 2018 Sarah Devens Award, as announced by the Hockey East Association today. Willard becomes the first Vermont player to win the prestigious award, and the first Hockey East player since Karen Thatcher in 2006 to be so honored. "Taylor is one of the most impactful and genuine people I have ever coached," said Vermont head coach Jim Plumer. "She led the team by example in her work ethic, was a caring and nurturing teammate off the ice, and was able to navigate the challenges of representing her teammates and also the coaching staff." A native of Naperville, Illinois, Willard was elected as a tri-captain of the Catamounts for her junior season in 2016-17 and serving as the sole captain of the 2017-18 squad. Willard was twice named to the All-Hockey East Second Team and was an honorable mention in her senior season. In 2016-17, Willard was also named to the New England Hockey Writers' Association All Star Team Averaging over 26 minutes per game in 2017-18, Willard was a key two-way player for the Catamounts as she scored four goals and 10 assists. During her sophomore campaign, she finished second on her team in scoring with 10 goals and nine assists, including six power-play goals. For her career, she notched seven game-winning goals for Vermont. 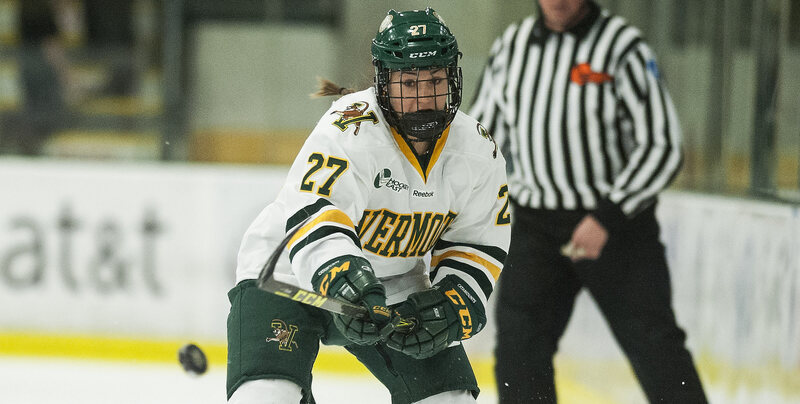 Willard ended her career with the Catamounts tied for the most games ever played in a Vermont uniform (145) while racking up the most career points for a defenseman (62) in program history. She also ranked tied for fourth in career assists (41) and sixth in career points (62). On the international stage, Willard donned the red, white, and blue of Team USA in 2014 to help the Women's National Under-18 Team claim the silver medal at the IIHF Under-18 Women's World Championship in Budapest, Hungary. During her time as a student-athlete, Willard became heavily involved with multiple charity initiatives and was especially involved in organizing events surrounding the Catamounts' Team Impact teammate. Further, Willard was instrumental in a mentor program at a local elementary school, helping to support and provide guidance to the students there. She also lead her team in several volunteer programs, including assisting with local charities in the Burlington, Vermont area. Willard is a four-time member of the Hockey East All-Academic Team, inclusive of athletes who achieve a GPA of 3.0 or higher in each of his or her semesters on campus. Entering h er final semester at Vermont, she carried a cumulative GPA of 3.60 while she majored in Nutrition and Food Sciences. Past recipients of the award include: 1997 -- Kathryn Waldo (F), Northeastern; 1998 -- Sarah Hood (F), Dartmouth; 1999 -- Jamie Totten (D), Northeastern; 2000 -- Carrie Jokiel (F), New Hampshire; 2001 -- Christina Sorbara (F), Brown; 2002 -- Dianna Bell (F), Cornell; 2003 -- Rachel Barrie (G), St. Lawrence; 2004 -- Lindsay Charlebois (F), St. Lawrence; 2005 -- Nicole Corriero (F), Harvard; 2006 -- Karen Thatcher (F), Providence; 2007 -- Lindsay Williams (F), Clarkson; 2008 -- Lizzie Keady (F), Princeton; 2009; -- Marianna Locke (F), St. Lawrence; 2010 -- Laura Gersten (F), Rensselaer; 2011 -- Jackee Snikeris (G), Yale; 2012 -- Aleca Hughes (F), Yale; 2013 -- Alyssa Zupon (F), Yale; 2014 — Vanessa Gagnon (F), Clarkson; 2015 — Chelsea Laden (G), Quinnipiac; 2016 — Alison Rolandelli (D), Brown; 2017 — Paula Voorheis (G), Cornell.